Goitse prides themselves on their ability to play traditional Irish music as well as write original compositions. A crowd of 600 clapped in rhythm with the upbeat reels and percussive beats of the Irish bodhrán drum echoing through the Center for Faith and Life Main Hall. The five musicians engaged one another with poise and excitement as they danced around the stage. The hoots and hollers from the back of the hall seemed to encourage the jigs as they picked up tempo, almost flying out of control. Within five minutes, audience members were captivated by the music of Goitse. This Irish quintet brought their music to the CFL on Thursday, March 14 as a part of the Center Stage Series. Goitse, pronounced Goh-cha, consists of percussionist Colm Phelan; violinist, singer, and tin whistle player Áine McGeeney; guitarist Conal O’Kane; piano and accordion player Tadhg Ó Meachair; and banjo player Alan Reid. The band started touring right after they graduated from Limerick’s Irish World Ac ademy in 2011 and have been full-time musicians ever since. 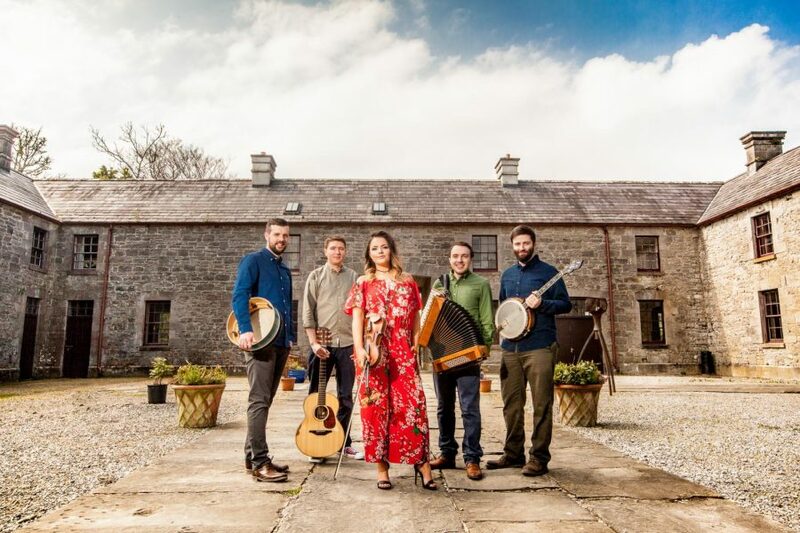 Goitse has won many awards, such as LiveIreland’s “Traditional Group of the year” and Irish American News’s “Group of the Year.” They also won the 2016 Freiburger International Leiter Award in Germany. They have released four albums and are currently working on their fifth. Ó Meachair explained the history of traditional Irish music and Goitse’s place in it. Traditional Irish tunes are learned by ear without written notes, making music a long-standing custom that has been passed from generation to generation. The group prides itself on their ability to mix famous Irish melodies with their own compositions. Award-winning bodhrán player Phelan captivated the hall through a solo set where he demonstrated the variety of tones and rhythms capable on this traditional Irish frame drum. Gasps of awe were heard throughout the crowd as he showcased his world-famous technique, and audience members immediately leaped to their feet when he finished playing. According to Director of Campus Programming Paul Atkins, although not intentional, this concert was timely in relation to people’s excitement for St. Patrick’s Day. The musical variety and engagement excited attendee Allison Meinheit (‘22). This enthusiasm was seen and heard through the cheers and hollers from the general admission balcony, which Atkins referred to as the “noisy section,” as well as through the crowd that gathered to meet the band members after the show. The excitement and engagement were seen not only on stage, but by those who worked with them from the moment they arrived in Decorah. “They are very genuine, friendly, flexible, accommodating, [and] very respectful of our time.” Performing Arts Committee President Alex Schaeffer (‘20) said. Goitse will continue to Pennsylvania to finish the rest of their 2019 international tour. The next Center Stage Series event will be EVOLUTION, a solo play written and acted by Patricia Buckley, which will take place on April 6 at 7:30 p.m. in the CFL Main Hall.